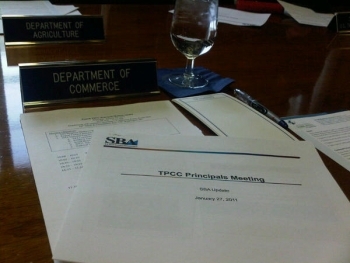 Commerce Secretary John Bryson today hosted a joint meeting of the Trade Promotion Coordinating Committee (TPCC) and the Export Promotion Cabinet (EPC) to discuss strategic priorities for promoting trade and U.S. exports and receive input on new initiatives. Secretary Bryson was joined by officials from the Export-Import Bank, Small Business Administration, National Security Council, and Departments of Agriculture, State, and Treasury, among other agencies. The TPCC and EPC support the president’s overall economic agenda by helping U.S. companies export globally and create jobs locally. 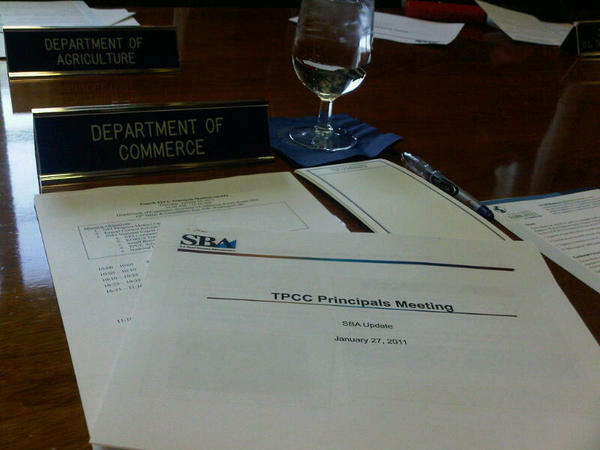 The TPCC is composed of 20 federal government agencies and chaired by the Secretary of Commerce. The EPC was established to coordinate the development and implementation of the National Export Initiative (NEI) along with the TPCC, helping to meet the president’s goal of doubling U.S. exports by the end of 2014. During the meeting, which was his first as Commerce Secretary, Bryson highlighted the progress with NEI and the need to strengthen efforts to continue to increase U.S. exports. In 2011, the U.S. exported over $2.1 trillion in goods and services, the highest on record and the first time in history that America has crossed the $2 trillion threshold. Despite the positive signs of economic recovery, the president has made clear that lasting economic growth requires leveling the playing field for American workers and businesses and making sure they are able to compete successfully in global markets. 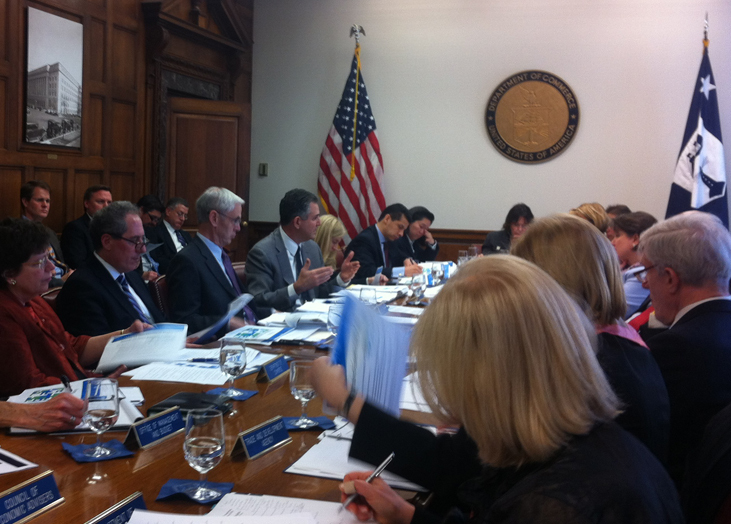 U.S. Commerce Secretary Gary Locke, on behalf of the Trade Promotion Coordinating Committee, today released to Congress the 2011 National Export Strategy: Powering the National Export Initiative (PDF). The report reinforces the importance of U.S. exports of goods and services, which in 2010 totaled $1.84 trillion, an increase of nearly 17% over 2009 levels, and supported more than 9 million jobs in the United States. Removing barriers to trade, including through passage of the South Korea, Colombia and Panama trade agreements. On the one-year anniversary of the launch of President Obama’s National Export Initiative, U.S. Commerce Secretary Gary Locke, Agriculture Secretary Tom Vilsack, U.S. Trade Representative Ron Kirk, Small Business Administration Administrator Karen Mills and Export-Import Bank Chairman Fred Hochberg announced today the launch of a year-long, interagency, multi-city outreach campaign designed to help connect small and medium sized businesses (SMEs) with the resources they need to sell more of what they make overseas. “For America to win the future, more small and medium sized businesses must export, because the more small businesses export, the more they produce; the more they produce, the more workers they need, and that means good-paying jobs here at home,” Locke said. The first of these New Markets, New Jobs events is scheduled for February 17th in Minneapolis, Minn. Locke is expected to be joined by Kirk, Mills, Hochberg, Minnesota Governor Mark Dayton and Minneapolis Mayor R.T. Rybak, among others. The Minnesota stop will be followed by events in Los Angeles, Calif., Louisiana and Wilmington, Del. in the coming months. The conferences, which were called for in September’s Report to the President on the National Export Initiative, are intended to reach more than 3,500 small and medium sized companies interested in exporting. Twenty-four U.S. businesses will join Commerce Secretary Gary Locke for a business development mission to India on February 6-11. The businesses joining the trade mission are based in 13 states across the country and more than half of them are small- and medium-sized companies. The delegation, which also includes senior officials from the Export-Import Bank (EX-IM) and the Trade Development Agency (TDA), will make stops in New Delhi, Mumbai and Bangalore, where Locke will highlight export opportunities for U.S. businesses in the advanced industrial sectors, of civil-nuclear trade, defense and security, civil aviation, and information and communication technologies. Locke accompanied President Obama to India in November, where they witnessed more than $10 billion in business deals between U.S. companies and Indian private sector and government entities, supporting 50,000 American jobs. The India business development mission will help build on the exporting success U.S. companies had 2010 – up 17 percent compared to the same period in 2009. It will be Locke’s second trade mission as Commerce Secretary; in May, he led a clean energy business development mission to China and Indonesia. Today Secretary Locke joined seven other U.S. government agencies in launching the Renewable Energy and Energy Efficiency Export Initiative, a coordinated effort to promote renewable energy and energy efficiency exports. Through the Initiative, the U.S. government will support renewable energy and energy efficiency (RE&EE) exporters by offering new financing products, enhancing market access, increasing trade promotion and improving the delivery of export promotion services to current and future RE&EE companies. The federal government is also launching a new online portal as part of the Initiative to provide renewable energy companies easy access to government export resources, and the Commerce Department is committing to an increased number of RE&EE trade and trade-policy missions. Energy is a $6 trillion global market, and clean energy is the fastest growing sector.